.. to the website of St Michael's Old Church, Betws-y-Coed, formerly a church of the Church in Wales in the Diocese of Bangor, part of the worldwide Anglican family of churches. We hope that you will enjoy your online visit ­ and that you will visit us in person soon. Built in the 14th century, St Michael's Old Church is the oldest building in Betws-y-Coed, and is located on the banks of the River Conwy. Replaced by the parish church of St Mary's in 1873, St Michael's lay slumbering peacefully throughout the twentieth century. But by the early 1990's it was in a sorry state, with a leaking roof and associated plaster damage ­ and it was urgently in need of repair work. In 1994, the Friends of St Michael’s was formed, to raise both awareness of the building, and money to preserve it. Declared redundant in 2000, the building is now leased from the Church in Wales by the St Michael’s Betws-y-Coed Trust, a registered charity (No 1081038), run by the Friends. 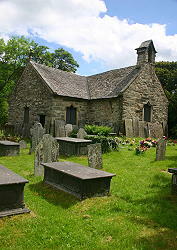 Nowadays hundreds of people visit St Michael’s Old Church in Betws-y-Coed in beautiful Snowdonia every year, and there are many different reasons for appreciating this simple and humble building. The church is normally open daily, 10 am until 5 pm, Easter until the end of October. At other times a key is available, during opening times, from the Conwy Valley Railway Museum (opposite the church). 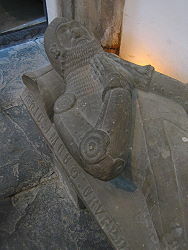 Visitors from all over the world come and enjoy the oldest building in the village, whilst for those with an interest in history, the stone effigy of Gruffydd ap Dafydd Goch has a special fascination. 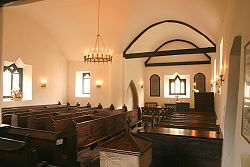 Students of architecture and church history learn much from the inside arrangements of the church. 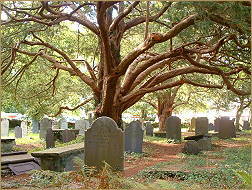 Most people appreciate a quiet place in which to sit and think and pray. St Michael’s is important for local Christians too, and despite being declared redundant it is still consecrated. As a balance to the splendour of St Mary’s Parish Church, reminding us of the glory of God, St Michael’s has a special intimacy and simplicity which can speak of the closeness of God. Nor is St Michael’s important only for Anglican Christians: because the building dates from before the religious divisions of recent times, it belongs in some sense to all of us, of whatever denomination, a symbol of the unity which is God’s will for his church here. Although the church is now officially closed for regular public worship, a service is normally held on St Michael’s Day (in September) and a candle-lit Carol Service at Christmas tide. In addition, the Friends organise a Flower Festival in September each year, which attracts hundreds of visitors to admire the floral displays which are provided by many of the local village organisations. It is hoped to open the church on a daily basis throughout September (10am – 5pm) to mark this annual event. Friday, Saturday & Sunday 7th – 9th September 2018. The church will be open 10am – 5pm daily. The church will be transformed with an abundance of floral displays all donated by local businesses and organisations. Entrance is free but a donation is always appreciated. Saturday 29th September, 6pm. Holy Eucharist. Light refreshments will be served after the service. The Annual Candle-Light Carol Service will be held in St. Michael's Church on Sunday 30th December 2018 at 6pm (not 29th as previously advertised). All villagers and visitors are welcome to come along for a service of readings and carols. It has been called "The Alternative Carol Service" and has proved very popular over the years, featuring readings of both seasonal secular and biblical tone. Seasonal refreshments are served after the service. Why not help by joining the Friends of St Michael's? If you’d like to know more about what we are doing to preserve the church, why not join the Friends of St Michael’s and receive our regular newsletter? Membership costs just £15 per annum (£25 to cover 2 adults at the same address) – join or make a donation now. Download our September 2015 newsletter here ( PDF document). You can also donate from your mobile phone using the Just Text Giving scheme. Just text SQNX30 £5 to 70070 to make a £5 donation (or change £5 to the amount you would like to donate - you can donate £1, £2, £3, £4, £5 or £10). You can add Gift Aid to your donation by following the instructions sent to you by text after you have made a donation. See the find us page for a Googlemap and route planner. 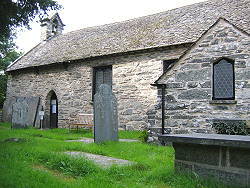 Copyright Friends of St. Michael's, Betws-y-Coed. All rights reserved.